I am an Associate Professor in the Department of Physics at the University of Alberta in Edmonton, Alberta Canada. I received my Ph.D. at Northwestern University in Evanston, Illinois. Originally from St. Louis, Missouri, I did my undergraduate education at Washington University in St. Louis. Our research focuses on large scale quantum objects, in particular nanomechanical objects at low temperatures and superfluids in restricted geometries. 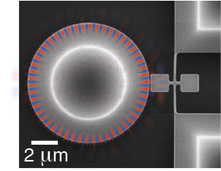 This work combines precision nanofabrication, cryogenics, optomechanics, and quantum measurement protocols. We are also interested in putting these devies to good use, specifically in sensor technology for real-world applications such as point-of-care diagnostics. Find out more on the research page. And if you want more detailed information about me you can download my CV.